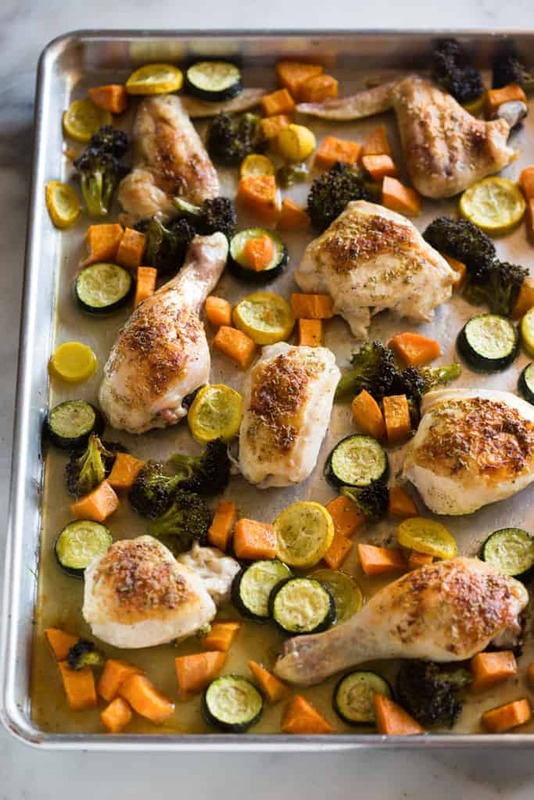 One Pan Roast Chicken and Vegetables is a super easy sheet pan dinner with chicken pieces smeared in an herb butter and roasted with your favorite vegetables. One pan, minimal prep, and the easiest clean-up ever: this dinner is a winner! When people find out I’m a food blogger they often ask what type of food I make, or who my audience is. I’ve thought about that question a lot lately, and a reader actually summed it up for me. I make ” ‘real people’ food”. It’s not usually super fancy or with ingredients that are hard to find. But I use real ingredients, and make dinners that real, normal families would enjoy. That’s my goal anyways. And this One Pan Roast Chicken and Vegetables falls completely in line with it. This meal takes about 5 minutes to prepare. It’s cooked all in one pan (yay for easy clean-up), and it’s absolutely DELICIOUS. 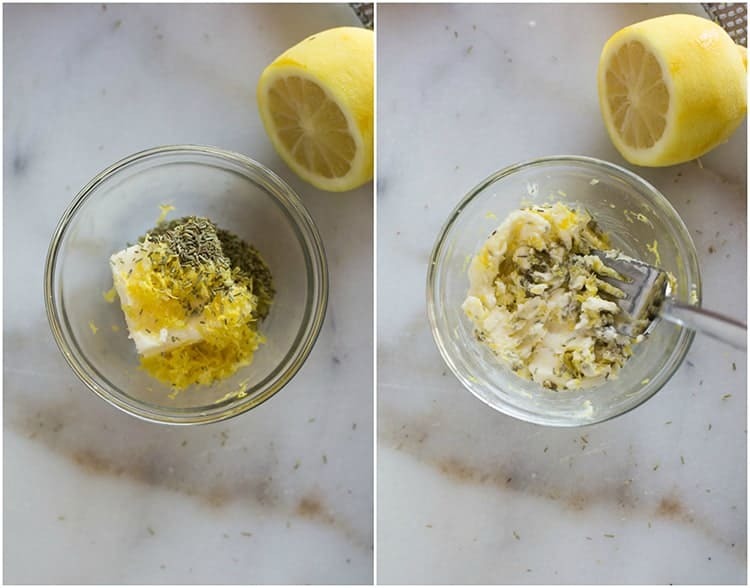 Make the compound butter mixture by combing the softened butter, lemon zest and rosemary. Smooth the butter over the outer skin of the chicken pieces. 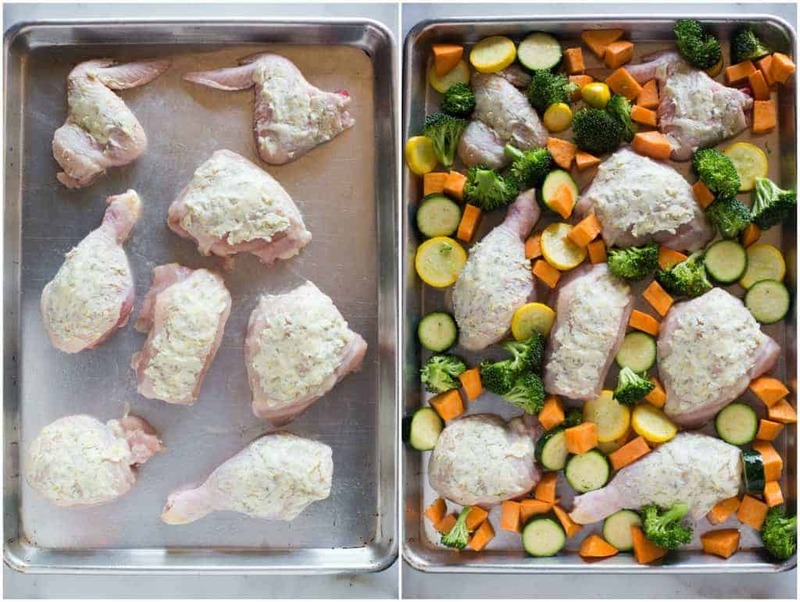 Arrange dark meat pieces (thighs and drumsticks) around on the outside edges of the sheet pan, and the white breast meat in the center. Toss the veggies in a little bit of olive oil and salt and pepper and arrange them around the chicken pieces. Roast at 425 degrees until the chicken is cooked through. When I make this dinner I usually buy a whole chicken, cut it into pieces, and then use the leftover chicken carcass to make the best homemade chicken noodle soup. Two great dinners for the price of one! You could also just use chicken thighs, drumsticks, or whatever pieces you like. 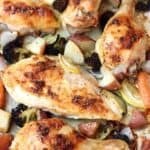 One of my favorite things about this roast chicken dish is that the options for vegetables to add to this dish are endless! I usually use whatever vegetables are in season or on sale at the grocery store. This meal really is a must-make. It’s has a “comfort food” feel to it, and it’s incredibly easy to make. 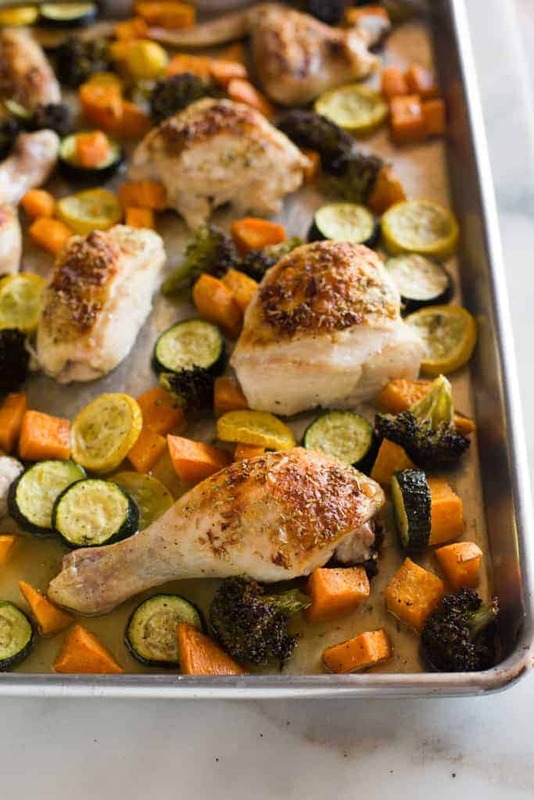 One Pan Roast Chicken and Vegetables is a super easy sheet pan dinner with chicken pieces smeared in an herb butter and roasted with your favorite vegetables. One pan, no fuss and the easiest clean-up ever: this dinner is a winner! In a bowl, combine softened butter, lemon zest, and rosemary until smooth. Place chicken, skin side up, on a baking tray. Add veggies to a large mixing bowl. Drizzle with olive oil and season with salt and pepper and toss to coat. Add veggies pieces to the pan, all around the chicken pieces. Don't be afraid to add a lot of veggies because they will cook down a lot. Roast (uncovered) for about 40 minutes - 55 minutes or until chicken is cooked through. Allow chicken to rest for at least 5 minutes before serving. Awesome! Thank you for an easy dinner after work! Just gave this one a go! It was a success!! My husband loved it! He said he will take some to lunch tomorrow , which means he reallly really loved it. My 7 year old said this chicken is so yummy mommy. I will say I sub the rosemary for basil. That’s the only thing I changed. This is so delicious !! Very easy to make! Thank you so much! I’m always looking to try as many of the things on your site as I can because they’re so incredibly tasty also your detailed recipes definitely help me .. I’m not a natural . Much love to you … from your old city STL .